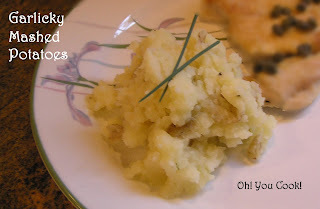 Here is the mashed potato recipe I promised you yesterday. Use thin-skinned potatoes and this becomes an easy-peasy recipe. Potato skins are supposed to be where the vitamins hide, so I recommend leaving them on. The fact that it knocks down the prep time by a few hours, give or take a few hours is a bonus. Is it just me, or does it really seem to take at least 60 minutes to peel one potato? As you can tell, I hate that job. Just pick out the larger pieces if you have really cranky mouths to feed. I served this to a couple of fussy children adults who didn't complain at all about the peels or the lumps. That's another thing. Totally smooth mashed potatoes are boring. Either the person making them works for a French restaurant or they have way too much time on their hands. They probably peeled the potatoes as well. I just tell everyone that my version is rustic style. That's my story and I'm sticking to it. 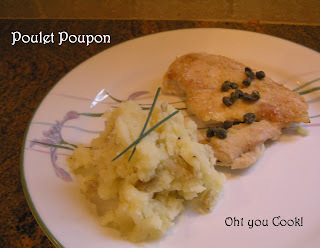 Here is a baked chicken recipe that proves healthy and delicious are not mutually exclusive. I had originally named this dish Pretentious Chicken, because of the dijon mustard (remember those Grey Poupon ads?) and the sherry used. But fun as that name was, it really wasn't very descriptive. So I thought, as long as I was using a French-style mustard, I tried pairing poupon from the mustard brand with poulet, which is French for "chicken." I really didn't know if poupon meant anything, so I fired up Google Translateand discovered it means "little baby" (Little Baby Grey, or Little Grey Baby ... very descriptive. The titles just make you think of mustard. France is such an interesting place ... ballet dance steps are named after food, and food is named after infants ... but I digress ...) PouletPoupon ... Little Baby Chicken! Now that's a name! Score!